Prominent & Leading OEM Manufacturer from Gandhinagar, we offer vacuum circuit breaker tester and vacuum interrupt tester. Veer Electronics make Vacuum Interrupter Tester tests the vacuum Interrupter Integrity by applying a Pulse DC Voltage across the Interrupter under Test. When this Voltage is applied to the Vacuum Interrupter, if Interrupter Is defective then an electronic Buzzer gives the Audio indication as well as Red color Fault LED also gives the Visual indication of the fault. Charging Time: 15 Hrs Approx. Battery Life: 200 Cycles / 2Years approx. Size of Instrument ( L x B x H): 265 mm X 145 mm X 255 mm approx. Weight of Instrument: 6.5 kg approx. 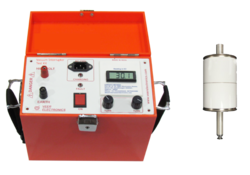 Veer Electronics make Vacuum Interrupt Tester tests the vacuum Interrupter Integrity by applying a Pulse DC Voltage across the Interrupter under Test. When this Voltage is applied to the Vacuum Interrupter, if Interrupter Is defective then an electronic Buzzer gives the Audio indication as well as Red color Fault LED also gives the Visual indication of the fault.